So I picked up a few more colours of Copics yesterday which put me in the colouring mood. I believe all the colours I used on Drake I already had, but I was having lots of fun experimenting with different colouring techniques before I finally made a card. 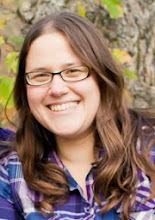 The big thing I learned: definitely do NOT over look the value of having the shades of grey. When you want that slight shadow over top of some colour, the greys come in very handy. I didn't use them on Drake, but I did on some of my other items yesterday. I also found having one of the lightest colours in each grouping works nicely in place of the blender pen. So for Drake, I coloured his body first with YG95 (Pale Olive), then I added in some shadows with G99 (Olive). Next I went back with YG95 to blend the two Olives. There was still an apparent line of separation between the colours, so I took YG91 (Putty) and went over the entire body with that. That blended the colours nicely. 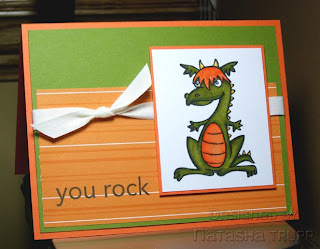 Supplies: Stamps: Drake can be found here! Sentiment can be found here! For some reason I am really looking forward to this long weekend. It's not like it's been an overly stressful week, not at all actually. It's just nice to have 3 days off. Mondays off are few and far between! 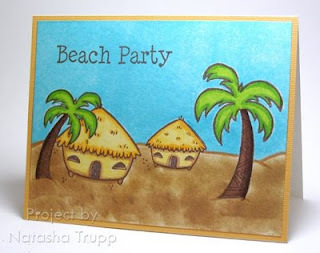 Today's card was inspired by one of Kristina's MACM creations from June. When I say I was inspired, I don't mean CASE in this situation. 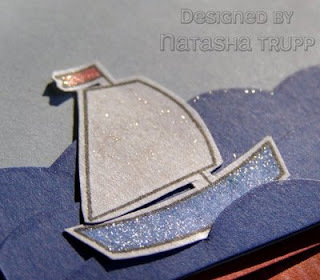 Her card inspired me to use my gel-a-tins Off to School stamps, as well it inspired me to get back into embossing and make my own backgrounds with dot stamps. This card really was one of those cards where I sat down, started with a totally random part and went from there. I decided I wanted to use a brighter colour, so guava it was. Next up, I really wanted an embossed dotted background, or a partial one any way. I grabbed this cute dot from Flower Frames and Letters. If you remember Stampin' Up! 's Alphadots set from a few years back... this set is similar. I like this one better though since all the letters are capitals (I cannot STAND when an alphabet provides a mix of upper and lower case, decide on one, you know!). It's also a clear set, so it's super easy to line up, and it comes with a few fun flower and dot center images as well. Basically, if you were ever regretting not getting Alphadots and like clear stamps, you may want to look at this set. Okay, back to the creation. So I stamped that dot with versamark, clear embossed it, then worked on my sentiment panel. I did a sample stamping on some scrap white first (pre-embossing!) to see just how much space I would need. I would highly recommend doing that when piecing together sentiments with larger alphabet sets. By the time I was ready for the embossed sentiment I knew exactly how I wanted the placement. 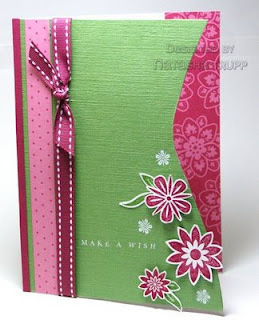 Finally, I added in some stitched ribbon and I stamped and embossed a flower to add a bit more interest and "pop" to the card. To emboss with dye inks, remember, ink up the stamp first with versamark, then ink over that with the dye ink, stamp it, and cover with embossing powder. Have an awesome long weekend! I really love the DoodleFactory stamps for making scene cards. It's funny, before I came across these stamps I NEVER made scene cards. The images are just so much fun to colour and piece together. Despite the colouring and masking this card came together pretty quickly. I stamped the trees and huts, masked them, drew the dunes, then brayered the sky and sponged the sand. I really can never get enough of star images. I just love them so. 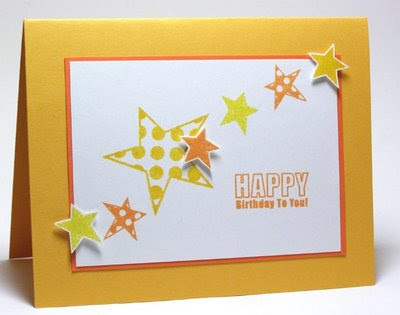 Here's a quick, bright and cheery birthday card. When I got up this morning a note was left for me on the kitchen table. Typically these notes are dinner suggestions. Today's note was a request for an anniversary card. I can't think of whose anniversary it may be, but I happily complied with the request. I spotted this colour challenge and decided to use those colours. 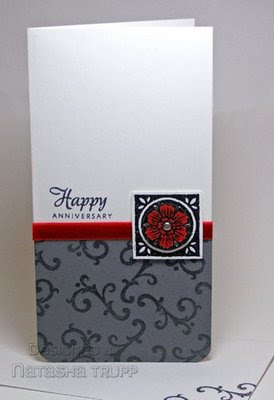 I thought with the addition of red as my accent colour I would come up with a nicely elegant anniversary card (since I don't know who the recipients are, I thought elegant and not too flowery were safe choices). I know Kristina suggested that the black and white should really stand out. I found that when I looked at the picture, the combination of grey and white stood out more to my eye. So I used those as my two main colours, with the black and red as accent colours. This card measures 3.75x7.25. I found an envelope first, decided I wanted to make a long style card, then picked my measurements based on that envelope. I really wanted to make the card with the fold at the top, but I don't have any white cardstock that measures 14.5 inches long, so a side fold it was. I did the corner rounding at the bottom edge, as is often typical for long style, top-folded cards. 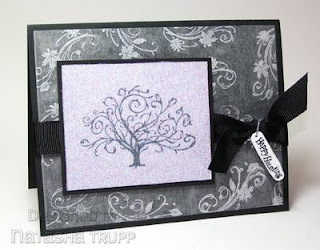 I always like having the new Stampin' Up! catalog in my hands. 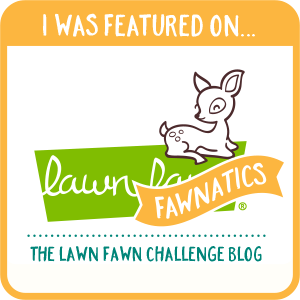 Not only is it fun to make a new wishlist filled with exciting new stamps and other products, but there are always fun new ideas and samples. This card was inspired by the one on page 137. I used some of the papers and images I had on hand to recreate it. First, the flowers I chose come from the It's Beautiful jumbo wheel. I was hemming and hawing over getting the A Beautiful Thing set (I still am!) and the wheel seemed like a good compromise. I inked up the flowers with a pomegranate spot, stamped those, cleaned the wheel, then inked up a few leaves with wasabi. I cut those out and pieced it all together. The wavy edge was done freehand with an xacto knife. I had it all put together with the sentiment, but then I decided it needed a bit more, so I added a few white flower rub-ons from the coordinating rub-on set. So what are your must haves from the new catalog? I'm waiting until September to get anything, but I do know that Eastern Blooms, Pocket Silhouettes, the Hidden Garden Rub-ons, the Haiku and Hawaii Papaya papers, as well as the Ghostly Greetings paper, and Chills & Thrills rub-ons are all on my list. Well, I hope you've enjoyed my week of all things PaperTrey Ink! I sure had fun making these cards and I'm always glad to hear from my visitors! 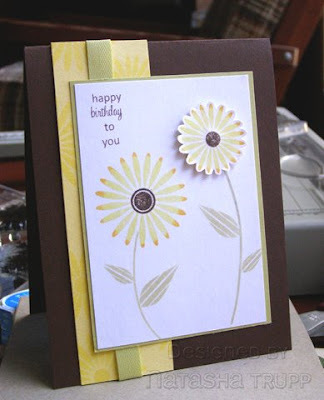 This last card was very much inspired by the amazing Mary Jo Albright. I loved the swap card she made and wanted to do my own version. My card has been simplified. I just really loved the look of the boat on the cut out waves, so that's what I did. It's funny, for this card, I started out with the boat. I wanted it sparkly, so I coloured it in with Spicas. I noticed how much that sparkly red seems to match Ruby Red. 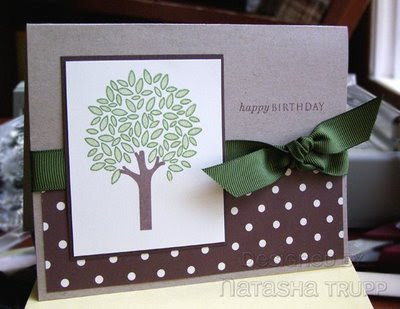 I was looking through my Stampin' Up designer paper collection and found the perfect match. This striped paper comes from the Ginger Blossom pack. Normally that set would not make me think of anything nautical, but this design on its own just fit! I added in some twill as my ribbon. 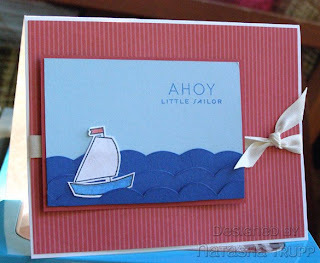 Anytime I do something nautical I have to use twill, it seems like it's a rule or something! I still wanted more sparkle so I drew along the edge of my free-handed bubbly waves. You can catch a glimpse of all that sparkle to the left. Again, I am so in love with the adorable line art of Bitty Baby Blessings. I never do paper piecing, I love the look, I just have WAY more solid images in my collection. There's just not much available in my stuff that works with this technique. I knew I had to try it out with this elephant. 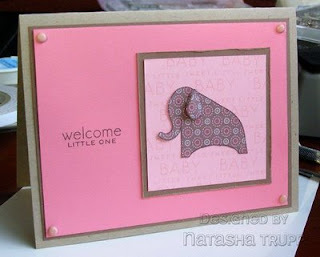 I stamped the elephant on a piece of Rebecca designer paper (retired Stampin' Up! ), cut that out, stamped an extra ear, then popped that up. I adhered the elephant to a wordy background (Sweet Little Baby). I wanted to do a bit of distressing to give that warm, cozy, well-loved look associated with stuff animals, so I distressed the cocoa frame. It's a pretty straight forward card, but I am really happy with how it turned out! Alright, I'm taking a mini break from birthdays. 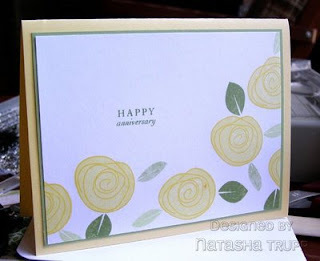 Another type of card that is in huge demand for the summer and early autumn- anniversary cards. I was still on my Lemon Tart kick. Once I had cut into it, I just kept going until the whole 8.5x11 sheet was mostly gone! The solid part of the roses was done with PTI's Lemon Tart ink, the leaves (both roses and leaves are from PTI's Garden of Life) and rose outlines were done with Memento inks (bamboo, new sprout, and dandelion). I finally picked up Mixed Messages. I know they provide the dimensions on the site, but wow, are these ever tiny! It'd be pretty awesome if they made bigger versions of these ones! This design is one that I could easily crank out several cards in an evening. Change up the colours and I'll be set for this upcoming anniversary season! I think I may go with a slightly larger sentiment for those ones though, I need to make a lot of cards for older couples. I should add in an decorated interior. It's pretty basic, but pretty and coordinated. 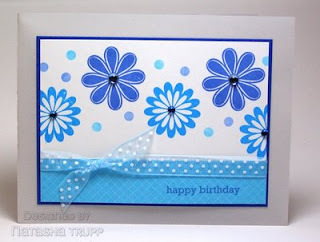 I just found out this card won in one of PaperTrey Ink's August Guest Star Stamper! I'm very excited! To answer a question, blues used are Memento's Bahama Blue and Danube Blue. I hope you are enjoying my week of PaperTrey Ink so far! When I saw the Floral Frenzy set, all sense of "sure I have enough flower sets" went out the window. Really, can you get enough flower sets? I don't think so, I keep adding them to my collection and I use so many of them for so many different cards! 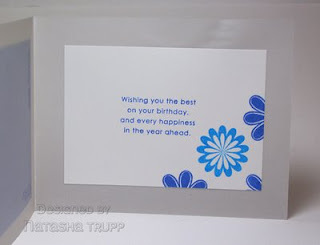 For this card, I kept to using only PTI products (except the white cardstock, I know people RAVE over their white, but I've got a decent supply that's also 110lb and a nice bright white, plus I can drive to the store to pick up a pack of 250 sheets, sets me back about $15.00). I thought these flowers would look really pretty inked up with Lemon Tart with just a bit of Summer Sunrise dabbed around the edges. 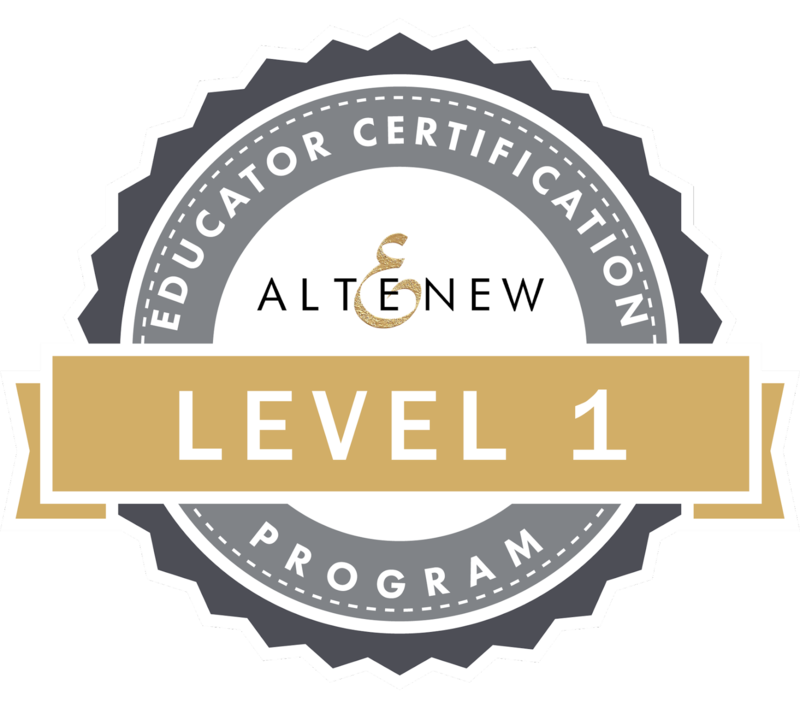 I was thrilled with the result! Can you believe I forgot my dimensionals (they are such a staple too!) during my weekend getaway?? So I had to get resourceful. I use double sided tape that comes on a large roll. To make dimensionals, I took a short, thin scrap of cardstock and folded it in half, twice. Then I wrapped it with my tape, voila, instant pop! 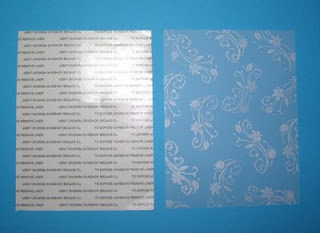 Anyway... the lemon tart cardstock was stamped with some flowers to make some pretty patterned paper. I added in a sentiment from Garden of Life and some Spring Moss twill. You know, I never used to need lots of birthday cards in August. There were just the 2 big birthdays in my life (my mom and dad, they are a week apart, today is my dad's birthday). It seems lately that I am needing more and more. I guess that's a good thing, means you know more people and want to bring little bits of joy to their lives with a handmade card. I really love all things tree (tree-y? tree-like?). I have had my eye on this PTI set for quite some time. I was waiting to put together a larger order. So when I finally placed that order, the set Father Knows Best had to jump into the cart. Pairing it with chocolate, vanilla, craft, and olive just seemed like the natural thing to do. I thought about going all distressed on it, but I really loved the clean look to the dots and lines. I really love how quickly this card came together. I am totally going to make a big bundle of these in summer and fall colours to keep on hand for masculine birthday cards! I'm thinking this particular design would look amazing with some rusty coloured leaves, some striped orange/rust papers and some wider chocolate or rust ribbon! What's that sound??? The sweet sound of relief as my latest PaperTrey Ink order did not come with any customs fees, woot! I was also impressed with the speedier shipping. I ordered on the 29th, it was shipped the 30th, and arrived on the 7th. I was really glad it arrived pre-weekend, since the plan was to head to a friend's cabin, and I wanted to bring some new stamping stuff! As I mentioned yesterday, it seems like everyone is having babies, so I finally felt justified in ordering Bitty Baby Blessings. It's really one of the cutest line art baby sets I have seen. I also love the versatility of animals, they can always work with other card themes! Also in my order was some of PTI's Lemon Tart. Oh my goodness, it's the most beautiful yellow ever! I just love it, and I foresee myself needing more in the semi-near future. It has made me love pastels (I'm more of a brights and earthy kind of gal). As I mentioned, I was heading away from my studio for the weekend. It's always difficult determining what to bring. So... here's what I brought (and I have to say limiting myself really made me stretch my creativity). It seems like I know way too many people who have just given birth or will do so very soon. So here are a few baby cards I made. These two designs are super quick and simple. They would also work nicely as birth announcements. I had some scalloped pieces of this luscious brown by Bazzill laying around, so I thought that would make a really nice edge on my cards. I grabbed a piece of Soft Sky for the boy card. I chose the colour because it matched the blue in this American Crafts ribbon exactly! Next up, I grabbed one of my first gel-a-tins sets (and favorites) Pet Shop. 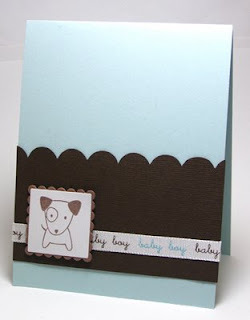 I thought this cute puppy would work well for the baby boy card. 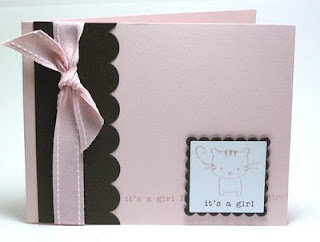 For the baby girl card, I grabbed some PaperTrey Ink Sweet Blush cardstock and matching stitched ribbon. I still had plenty of the scalloped paper left over, so I used that again. I really liked the idea of the announcement on the ribbon of the other card. Since I didn't have any matching ribbon, I went with a stamped sentiment (comes from SU! 's So Many Sentiments) with the image, as well as behind the image. For this one I went with the cat. It's just one of those things, cats always seem more feminine to me, just like dogs seem more masculine. I don't know why. 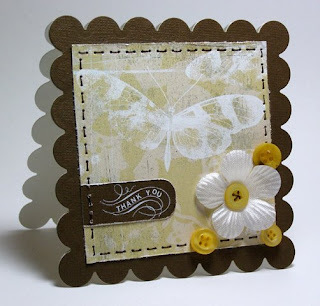 Here are a few butterfly cards that I made recently. Oddly enough they both ended up being thank you cards too! I was trying to practise a "scrappy style" meets "my style" type creation. For the first card, I really, wanted to do some stitching, but it ended up being very tedious as I did hand-stitching. I loved the distressed look to this Basic Grey Perhaps paper so I stuck with that theme, adding in a distressed tab, some distressed edges, and some mismatched buttons. The thank you image is from a Basic Grey rub-on set. For the second card I went with something WAY faster. 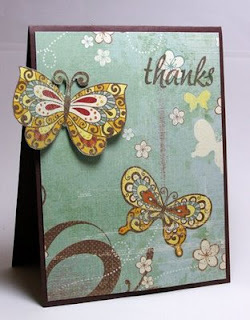 I saw these butterflies in this K & Co. Wild Saffron paper and thought they should take center stage on a card. I left the one on the paper. The card was too plain, so I cut out a second butterfly and popped that up. I only attached it along the body so that wings had the illusion of fluttering. 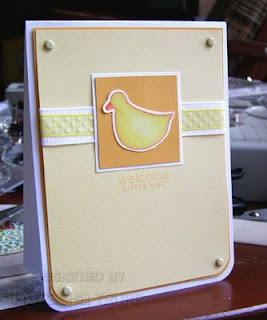 I added in a sentiment from Verve Stamps that I thought went nicely with the whole ensemble. Thanks for stopping by today. 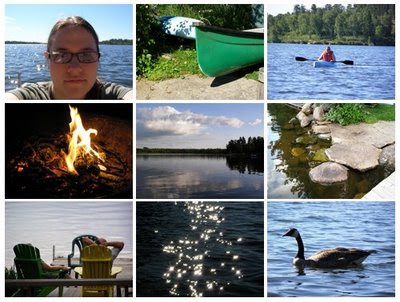 I was at a cabin for the weekend, took lots of nature photos and made lots of cards too :D So I'll be sharing those this upcoming week. I am really loving this Cat set by Inkadinkadoo. I think this image is my favorite though! It reminds me of my first cat, Deena. She had several of the characteristics of a Siamese (the meow, the attitude, the intelligence). She was half-Siamese, but ended up grey and didn't have the associated health problems of a full-bred. Any way, I really wanted to use some of the Bali Breeze papers, so I chose my papers, then chose the ink and ribbon to match. I went with a simple layout, but I just love the vibrancy of the colours! 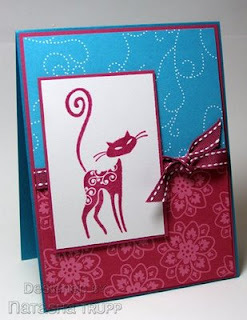 I chose the teal papers specifically because the dotted swirls kind of matched the cat's. Make tags more often! I absolutely love the idea of putting together tags. I know they don't seem to serve as much functionality as cards, however, the only thing that is truly holding that functionality back is me. 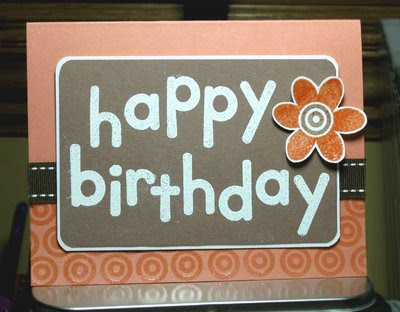 There is no reason you couldn't make an over-the-top tag instead of a birthday card. I made this tag for a recent call, however, I didn't read all the instructions of that call, so I'm thinking it has a low likelihood of getting picked. I submitted anyway, but I thought I'd share here too. One thing that working with a tag canvas made me realize- I really, REALLY wish I had more chipboard alphabets. I'm thinking I need to find a really great die-cut alphabet or two to have on hand, just so I can make my own chipboard alphabets. I caught a glimpse of the upcoming Stampin' Up ones, but $177.95 is quite steep for one alphabet (Serif Essentials, no clue on the size, one die is 5.5x6, and there appears to be 4 letters per die). I could buy a whole lot of pre-cut chipboard alphabets for that price. So I guess I'm kind of torn. Anyway, here's my tag. 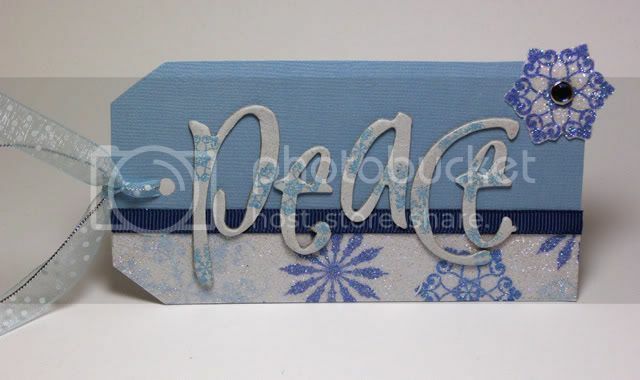 I had lots of fun stamping, using glitter, and inking up these letters from a Basic Grey Christmas collection. So today I have a bit of a tutorial/product focus for you. Tape- it's on every stamper's list, you can never have enough (you never would want to come across the situation where you run out!) There's also the ongoing search for the perfect tape for specific projects. You want extra sticky for keeping that chipboard attached the a card, you want to simply keep your card together after it survives a trip through the postal service, or you want to attach vellum. It seems there's a tape for all of these things. I have recently discovered Stamper's Magic Tape thanks to Tracey. It's great and comes in quite the assortment of shapes and sizes. I have a few of the 6x10 sheets. There were claims that this was the stuff to use with vellum. 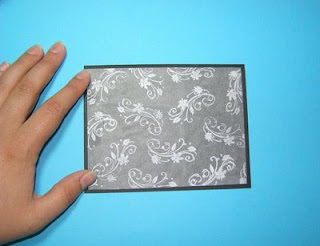 I love putting vellum on my cards, but I don't always want to attach it with brads, you know? Now for my finished product. I also used the tape on the tree piece. For that I covered the stamped image with the tape, than coated in glitter. 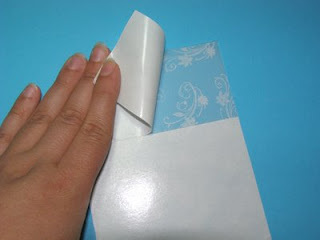 Easy, and SO much cleaner than dealing with interfacing, white glue, or packing tape!